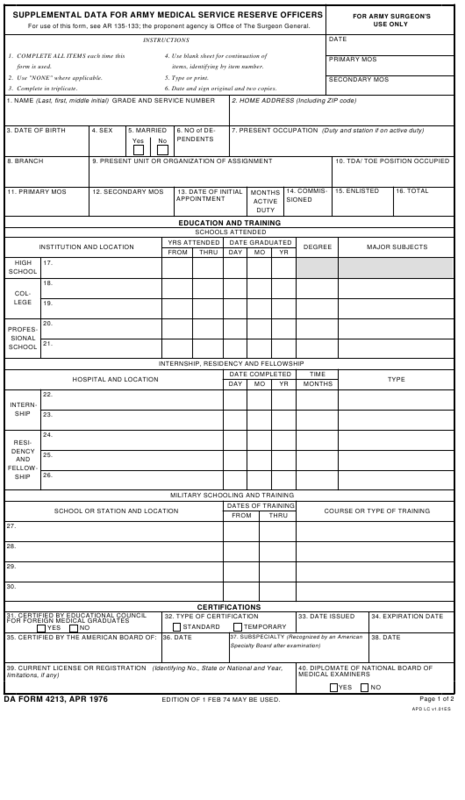 DA Form 4213 - also known as the "Supplemental Data For Army Medical Service Reserve Officers" - is a United States Military form issued by the Department of the Army. The form - often mistakenly referred to as the DD form 4213 - was last revised on April 1, 1976. Download an up-to-date fillable PDF version of the DA 4213 down below or look it up on the Army Publishing Directorate website. For use of this form, see AR 135-133; the proponent agency is Office of The Surgeon General. items, identifying by item number. 2. Use "NONE" where applicable. 6. Date and sign original and two copies. EDITION OF 1 FEB 74 MAY BE USED. IS FACTUAL, ACCURATE AND COMPLETE TO THE BEST OF MY KNOWLEDGE AND BELIEF.